We’ve all heard the one about how if you swallowed gum, it would stay in your system for seven years. The still waters of Bear Lake weren’t enough, so people concocted the idea of the Bear Lake monster. If you pull too many faces, you’re going to get stuck that way, which would be awful for your mother on picture day. When something is too ordinary, we humans have a way of taking it to the extreme and turning it extraordinary. Rubbish is just that: rubbish. It’s uninteresting and hard to get even a little bit excited about, let alone get your child into. As with anything in life, people have gotten bored with recycling. Though some of these myths seem pretty standard, there are some that would blow your mind. Of these waste management myths, how many have you fallen for? There’s no need to be ashamed. The disposal process changes year to year, making it challenging to keep up with. But the more you know, the easier it will be to recycle responsibly. You’ve probably watched your elderly mother or grandmother scrub the life out of the old pickle jar, remove the label, gather the cap in a separate pile and prepare the item before placing it inside her blue recycling bin. This is because there was a point in time when folks were told that items needed this kind of care before they could be sent away. Do her a favor and let her know that she’s wasting her time. The way that waste management plants are set up now, the processing system allows for items to be cleaned as they go. While you’re helping out an employee by not leaving a bunch of laundry detergent inside of the carton, you’re doing unnecessary work for all other things. When it comes to lids, these items don’t need to be left off like they once did. However, they do need to be processed correctly. This is because lids have different kinds of resin that don’t always blend. Employees can take care of this part at the waste management centers. Don’t waste your time. This one is a major false. Many people throw the idea of recycling to the wind, because all waste will break down naturally. Sure that’s true, but most items aren’t going to break down and decompose in our lifetimes. Plastic, for instance, can take up to 450 years to break down and fade out of existence. When you overwhelm a landfill with items like paper and plastic, it ruins the way that food is decomposing. This is because food needs oxygen to break down. If it’s packed into a small space with all other kinds of trash, it doesn’t get that and will instead be an ugly mark on our landscape for years to come. If you shampoo and condition religiously every night only to find out that your shampoo and conditioner are the same product, you’d feel like you wasted hours of time. We don’t like to repeat ourselves. In the case that you carry the idea that trash and recycling end up in the same place, it may be hard to motivate yourself to care about sorting and paying to have these items taken away separately. But don’t let yourself get angry at this idea just yet. When it comes to trash, your waste will end up in a landfill. When it comes to recycling, these items are taken to an entirely different sorting facility. Myth #4: Doesn’t Recycling Use More Resources? You may be one of the folks who has got it in your mind that recycling actually uses more resources than simply throwing an item away does. It’s not an uncommon thought, and when you really think about the process that these products go through—transport, washing, sorting, melting, rebuilding, redistributing—you might believe this one. However, you’d be wrong. In the long run, reusing these items and finding a new life for them will cost less. This is because new items don’t need to be mined and produced. Think of it this way, money spent on landfills (no matter how many pennies) is a waste, because all it is, is a storage center. If you’re concerned with the numbers, keep this one in mind: 84. This is because energy use is actually reduced by a full 84 percent when you recycle something. This one is a major falsity that we have addressed in depth on another page of the recycling resources. By not sorting your recycling, you’re guaranteeing that your local center gets low recycling rates. You should always do your best to put your recycling in the proper channels to keep materials in high quality and optimal shape. You’ve seen bottles or plastic grocery bags that have the recycling symbol emblazoned on them. If you’re like most people in the community, you could easily assume that this one means the item can and should be recycled. However, this is not always the case. The symbol is actually a sign that the item was made from recycled materials. If you put a plastic bag in your blue waste management bin, you’re actually dooming the facility that your items are sent to. This is because bags like these can end up in the cogs, which can cause the machines to break down. If you’re not sure, try to find further recycling resources online. Putting something in your single stream bin that shouldn’t be there will only waste more resources in the long run. 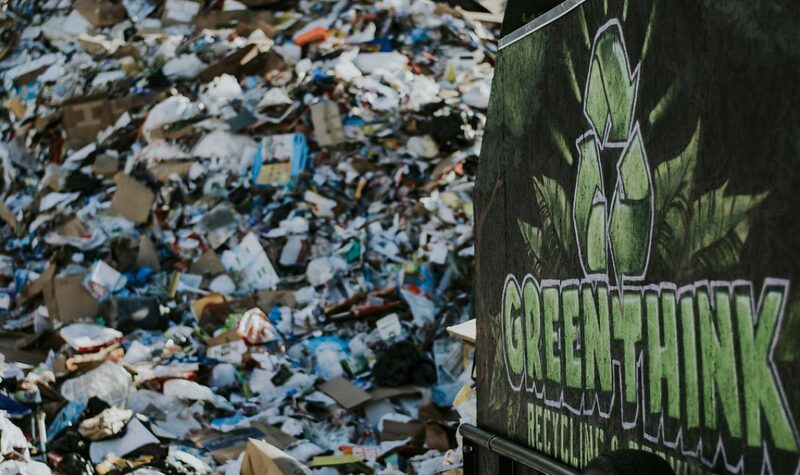 One of the biggest recycling myths that has been shared between generations is that people won’t care enough to recycle. It’s hard to get excited about, that’s no lie. But having clear signage and available bins in public areas have proven time and time again that recycling is something we all want to take part in, just as long as we’re presented the opportunity.